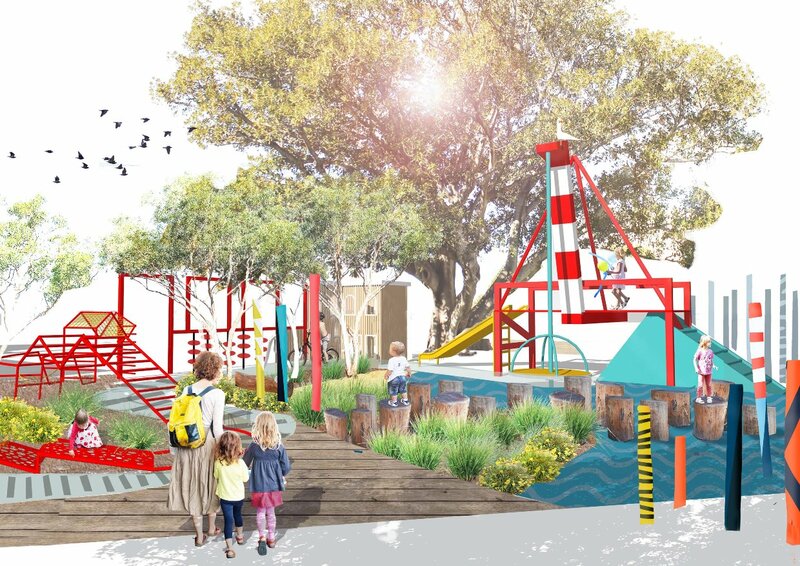 Draft concept designs for a new children’s play space planned for Fremantle’s Kings Square have been revealed. Inspired by the port city’s industrial history and close links with nature, the concept includes design features such as cranes, bridges, train tracks and shipping containers and incorporates natural elements including water and trees. It’s also set to feature bold lighting treatments, interactive soundscapes and tactile nature play elements. The draft concept has zones which appeal to a broad age range from toddlers through to primary school aged children and has been designed to be accessible for children with disabilities. The concepts are a major element of the City of Fremantle’s broader plan to upgrade public spaces as part of the once-in-a-generation Kings Square Renewal project. Last year around 170 Fremantle kids and their parents were asked to help design the new play space via surveys and a series of workshops at local schools. WA-based landscape architecture firm Seedesign Studio were selected via a competitive tender process to develop a concept based on this community feedback. Seedesign Studio director Joel Barker said the design was heavily inspired by the port, the ocean and the laid back Freo lifestyle with careful consideration given to the needs of kids and their parents/guardians. “Through the consultation workshops and brainstorm sessions kids told us they were keen to climb, swing and play in nature,” Mr Barker said. “They also told us they wanted water incorporated and with the ocean and river being a major part of the Fremantle experience, the concept includes a hand-pump and flow channel as well as interpretative water elements. Fremantle Mayor Brad Pettitt said it was fantastic to see the ideas of kids and their parents visualised in the concept plan. “The play space is a vital element of the Kings Square Renewal project and although there may be some changes when the final design is approved by council, it’s great to be able to get a visualisation on what this space could look like in a couple of years,” Mayor Pettitt said. The draft concepts are expected to be presented to council next month as one of a number of major elements in the broader public space renewal program. Following approval by council, the play space project will move into the detailed design phase. Over the last year we saw the conversation over whether there was a more inclusive Australia Day than January 26 dramatically evolve. In the lead up to Jan 26 2017 it was largely about Fremantle council and our decision. This year the conversation has gone nationwide and has gathered some serious momentum. There were hundreds of articles and media items on this but here are a few of my favourites. GIVEN the furore that surrounded the City of Fremantle last year, and the ongoing debate on the date of Australia Day since then, I was happy for Fremantle to keep a low profile this year. But in light of some of the hyperbole published in lead up to Australia Day, I feel compelled to respond to some of the common criticisms against changing the date. The first is that local governments should stick to roads, rubbish and rates and that the City of Fremantle has no business sticking its nose into a national issue. To suggest the City has no role in this debate is ridiculous because the trigger for the whole discussion was a decision about how best to spend ratepayers’ money. The council made a decision not to spend ratepayers’ money on a fireworks display on January 26 – a decision we are still very comfortable with – and instead use it to host an inclusive, family-friendly event on January 28. That decision has been vindicated, with around 15,000 people from all walks of life coming to Freo to enjoy the One Day in Fremantle event last year. From a business perspective, 89 per cent of local traders were open during One Day last year – compared with just 59 per cent on the public holiday. It’s better for business to have an event that attracts 15,000 people to Fremantle for a longer period and on a day when more businesses are open. But in addition to the practical decisions around how to spend ratepayers’ money, local governments are also obliged to advocate on behalf of their local community. Our decisions around Australia Day were in response to concerns expressed from local Aboriginal leaders, and came from a desire to hold an inclusive event where everyone could celebrate what’s great about being Australian. Issues like the marriage equality debate have demonstrated that our federal representatives can be behind the curve on matters of social change. Local governments interact with their communities at a grass roots level. They can, and should, advocate for their communities on national issues. Another argument is that changing the date of Australia Day won’t do anything solve the ‘real’ problems like Aboriginal health, education and unemployment. My answer to that is nobody said it would. Changing the date of Australia Day – like the Apology to the Stolen Generations or the recognition of the first Australians in our constitution – would be a symbolic gesture, but that does not mean it would have no value. The social disadvantages faced by Aboriginal people are deeply entrenched and have been suffered for generations. It will take a lot of effort and goodwill between Aboriginal people and governments at every level to tackle them. The recognition of historical truths and a demonstration of empathy for Aboriginal people will show that we care. From that foundation of mutual respect and trust we can then make a genuine effort to tackle the big issues like health and education. Changing the date of Australia Day is not the answer, but it is a respectful and healing step towards the reconciliation this country needs. While it is a necessary step it is not a sufficient one. We also need to close the gap on health and life expectancy and education, and we need to take seriously the recommendations of the Uluru statement that gives Aboriginal people an ongoing voice. The other main criticism I’ve heard from people who don’t like the discussion about changing the date of Australia Day is that it’s divisive. To those people, I’d simply encourage them to come down to the One Day in Fremantle event on January 28 and see for themselves how inspiring and uplifting it can be when people from all backgrounds and walks of life can come together to celebrate everything they love about Australia. What I have learnt over the last year is that changing the date of Australia Day is not the answer but it is a respectful and healing step towards the reconciliation this country needs. While it is a necessary step it is not a sufficient one. We also need to close the gap on health and life expectancy and education. We also need to take seriously the recommendations of the Uluru statement that gives aboriginal people an ongoing voice. The conversation is pleasingly heading in the right direction but there is a long way to go. From little things big things grow. And on the afternoon of this Sunday the 28th…. see you there! One Day in Fremantle on Sunday the 28th will kick off with a smoking ceremony at Bathers Beach at 7am. 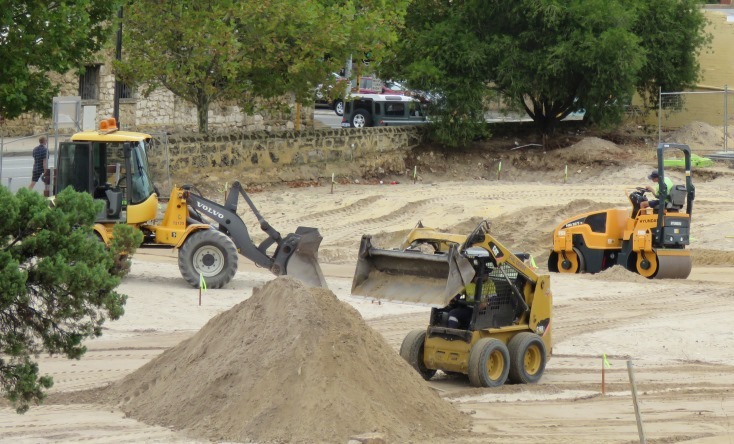 Construction is underway on 155 new parking bays in the centre of Fremantle. The new carpark is being built on South Terrace on the site of the old Stan Reilly Centre, which was demolished late last year. Construction will take just over two months, with the carpark expected to open in April. The new carpark will be a welcome addition to the approximately 5000 parking bays already available in the city centre. That includes over a thousand on-street bays and more than 2100 bays in the 28 off-street carparks managed by the City of Fremantle. This project will take an under-utilised site and turn it into a valuable asset for the community while we undertake more detailed planning of the redevelopment of Fremantle Oval, which will also include more public parking. The new Stan Reilly carpark will be in addition to the new 50-bay carpark on Point Street which opened in December. The City of Fremantle is also offering free one hour on-street parking around Kings Square to support local traders during the $270m Kings Square renewal project. Fremantle residents can also apply for a ‘Free after 3’ residents parking permit which allows them to park for free in on-street parking bays from 3pm until 11am, seven days a week. For more information on where to park in Fremantle visit the Parking page on our website. The library would love to have you over at our new space at the Fremantle Oval. We’re celebrating summer and invite you to come and create, play and make in this special Makerspace launching life at our new address. Try your hands at animation, robots, Lego, garage band, craft or chill to some tunes and nibbles. I will even be reading a story!